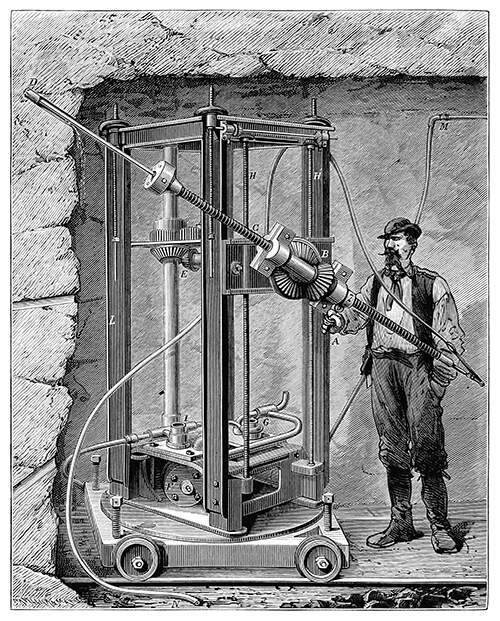 Georges Leschot's diamond drilling machine. The Leschot drilling machine and its operator. This machine was designed in 1862 by Georges Leschot and Charles Séchechaye, making it the first operational drilling machine fitted with black diamonds. 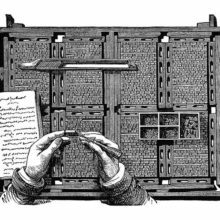 The first trials showed that in one hour and twenty-five minutes, it could bore into granite a hole 2 in (5 cm) wide and 14.5 in (37 cm) deep. 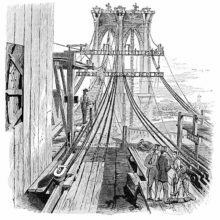 In 1867, it was displayed at the Paris Exhibition and by the mid-1870s, it had proved successful enough to be used by the mining industry in England, Switzerland, and the US. 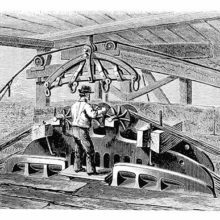 Similar machines were used to drill the shot holes in preparation for the removal of Hell Gate Rocks, near New York City. The caption reads in the original French: Machine perforatrice à diamant, de Georges Leschot.